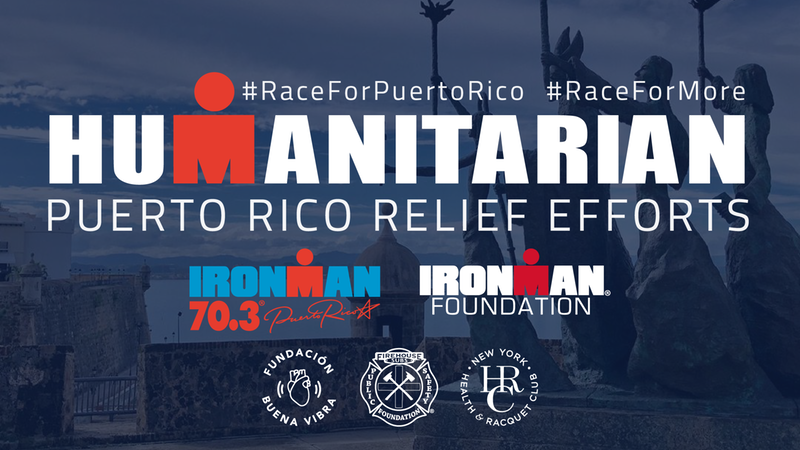 The IRONMAN Foundation will provide US$120,000 in Humanitarian Relief Effort funding to five non-profit organizations in Puerto Rico to support Hurricane Maria recovery efforts in conjunction with the IRONMAN 70.3 Puerto Rico triathlon, which will be held on March 18, 2018. The support includes a large-scale service project in partnership with the Buena Vibra Foundation, where 125 athletes and volunteers on March 19 will help restore homes and revitalize the community of Barrio Ingenio in Toa Baja. Grants will be awarded to five local non-profit organizations to address long-term recovery needs in five areas: reforestation, water quality, solar power, hunger and home restoration. Funding was raised by donations to the Humanitarian Relief Effort campaign including generous donations from New York Health & Racquet Club (NYHRC), Firehouse Subs Public Safety Foundation and NFL veteran Don Davey in conjunction with his fundraising efforts with the VIKTRE Challenge. The grantees will be recognized at the IRONMAN 70.3 Puerto Rico awards ceremony on Sunday, March 18. At the IRONMAN 70.3 Puerto Rico race expo on March 16 and 17, the IRONMAN Foundation will greet athletes and collect VISA gift cards to be provided to the ‘adopted’ families in Barrio Ingenio. Kyrsten Sinema, US Representative from Arizona and chair of the Women For Tri Advisory Committee, a program of the IRONMAN Foundation that seeks to increase female participation in the sport of triathlon. Don Davey, the first and only four-time Academic All-American in NCAA football history who went on to have a 10-year NFL career with the Green Bay Packers and Jacksonville Jaguars. He is also a six-time IRONMAN finisher. “We are grateful for the generosity of the IRONMAN community around the world for their support of our Humanitarian Relief Effort campaign, especially New York Health & Racquet Club, Don Davey and the Firehouse Subs Public Safety Foundation,” said Sarah Hartmann, Director of Community Relations for the IRONMAN Foundation. Service project volunteer registration is available until March 13 at ironmanfoundation.org/puerto-rico-relief-effort. Online registration for IRONMAN 70.3 Puerto is available until March 13 at www.ironman.com.